Ted Levin’s recent piece for the Boston Globe Magazine on reintroducing timber rattlesnakes to a Massachusetts island was aptly subheaded, “The plan to release poisonous snakes in the Quabbin freaks people out. But snakes are the ones that should be worried.” Timber rattlers are the subject of Levin’s forthcoming America’s Snake: The Rise and Fall of the Timber Rattlesnake, so he’s certainly the go-to authority on the situation. 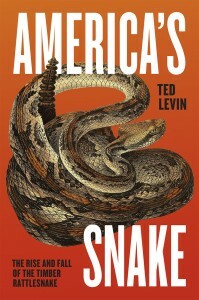 Below follows a brief excerpt, which outlines the perspective Levin suggests we embrace: Releasing snakes on Mount Zion may pose far more danger to the snakes themselves than there ever will be to shoreline fishermen or outdoors enthusiasts. Yes, rattlesnakes occasionally swim, but there is no evidence that they ever lived in the hills (now islands) in Quabbin Reservoir’s man-made wilderness. And it isn’t clear that Mount Zion could support a population of overwintering rattlesnakes. Even if the snakes could find a retreat below the frost line, no one knows if there are enough mice and chipmunks on the 1,400-plus-acre island to support them. The unleashing of rattlesnakes on Mount Zion should be viewed as a scientific experiment, starting with snakes from populations not as threatened as those here (like Pennsylvania). Step one should be: Release a . . . File under deep cuts. Recently in the New York Times, columnist Ross Douthat suggested an apt analogy, or at least a plausibly shared archetype, between Ted Cruz and Kenneth Widmerpool, the fictional (anti) anti-hero from Anthony Powell’s A Dance to the Music of Time series: A dogged, charmless, unembarrassed striver, Widmerpool begins Powell’s novels as a figure of mockery for his upper-class schoolmates. But over the course of the books he ascends past them — to power, influence, a peerage — through a mix of ruthless effort, ideological flexibility, and calculated kissing-up. Enduring all manner of humiliations, bouncing back from every setback, tacking right and left with the times, he embodies the triumph of raw ambition over aristocratic rules of order. “Widmerpool,” the narrator realizes at last, sounding like a baffled, Cruz-hating Republican senator today, “once so derided by all of us, had in some mysterious manner become a person of authority.” This is not exactly a flattering comparison. But the American reader, less enamored of a fated aristocratic order, may find aspects of Widmerpool’s character curiously sympathetic. And some of that strange sympathy could be extended to Cruz. To read more about A Dance to the Music of Time, click here. . . . The Essential Paul Laffoley: Works from the Boston Visionary Cell publishes this May (*super exciting*), but the meantime, here’s a teaser featuring a few of Laffoley’s paintings and video of the documentary The Mad One (Jean-Pierre Larroque/Doublethink Productions), after the jump. *** To read more about The Essential Paul Laffoley, click here. . . .
From Time‘s slightly soiled (c/o a surprise appearance by Evelyn Waugh) list of the 100 Most-Read Female Writers on College Campuses: Toni Morrison and Jane Austen are among the most-read female writers on college campuses, a new TIME analysis found. 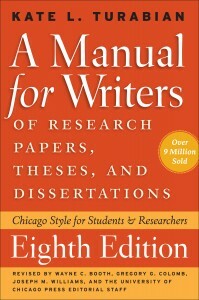 First place on the list—which is based on 1.1 million college syllabi collected by the Open Syllabus Project—goes to Kate L. Turabian for her Manual for Writers of Research Papers, Theses, and Dissertations, assigned in 3,998 classrooms over the last 15 years. Though much coverage of Time‘s list skewed toward questioning how Waugh’s inclusion made it so far along in the editing process (he clocked in at number 97), some blogs did point out that Turabian, while securing the top spot based on her gender affiliation at #17 overall, was still surpassed by 16 male-identified writers on a general ranking of syllabi (with Shakespeare, Plato, and Freud finishing near the top), rather unfortunately (and sadly, not all that surprisingly) leaving woman-identified writers completely out of the top ten. Read more about all things Turabian here. Read Time’s list in full here. . . .
Sociologist Jonathan R. Wynn went live in the Guardian last week with piece coincident with the 29th annual SXSW Festival in Austin, Texas—in which he articulated the role festivals like SXSW play in urban infrastructure, as they replace previously staid (and spatially permanent) cultural institutions, all the while playing an increasingly major socioeconomic role, especially in terms of gentrification and symbolic impact. 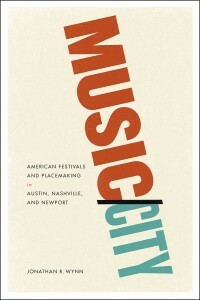 All of this draws on the research behind Wynn’s recent book Music/City, which considers the expansive and shifting roles played by these kind of festivals in contemporary urban and cultural life. In a brief excerpt from the Guardian piece below, he explores how previous mayor Will Wynn’s strategy of nurturing SXSW as a crucial part of the city’s downtown development played out of the course of several years: There are direct and indirect costs and benefits to Wynn’s strategy. While Austin’s downtown has seen robust growth, its inner core has gentrified, homeownership has risen well above the city’s median income, and the city’s poor have moved to Austin’s outer ring. Downtown condo, hotel and residential growth has boomed. When I returned to the Mohawk two years later, for example, I saw that the onetime dirt lot across the street had transformed into . . . In timely coincidence with today’s primaries and the book’s return to print, The Last Hurrah by Edwin O’Connor received some well-tailored praise from Pulitzer Prize-winning journalist David Hall, writing in the Columbia Daily Herald, who suggests we: Take a breather from the daily pounding of politics and reflect: chaos, confusion, and gutter campaigning are not new. . . . Even today’s politics are not speeding away. We have survived travail through democracy. Good and thoughtful fiction lets us pause and reflect. 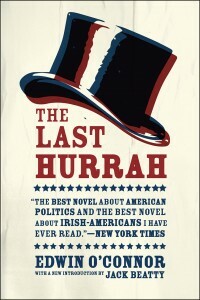 Honing in on The Last Hurrah, an almost-story adapted from the life of notorious Boston mayor James Michael Curley, he writes of the book’s foreboding about the nature of the relationship between media and politics: Another poignant tale of American politics is The Last Hurrah by Edwin O’Connor. 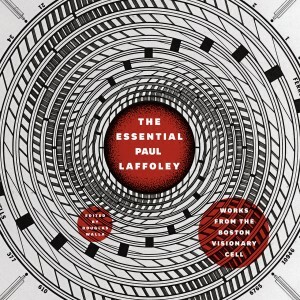 Set in an old and mainline northeastern city, the novel examines the dying days of machine politics when largess held voters in sway. Frank Skeffington, 72, believes he is entitled to one more term. His political compass loses its bearing against a young, charismatic challenger, void of political experience but adorned with war medals and good looks. O’Connor’s 1956 novel was prescient in portraying the impact television would have on politics. While The Last . . .
Sara Goldrick-Rab, author of the forthcoming book Paying the Price: College Costs, Financial Aid, and the Betrayal of the American Dream, with a powerful piece at Medium on #FAKETENURE: Driven by a desire to be a professor that worked for the public, I fought hard for tenure, earning it over a period of 7 years of 80-hour work weeks only slightly interrupted by the births of my two children. At several points, I tested the need for tenure — while still on the tenure-track, attempting to speak out and question the Boss. In response I received the sorts of threats and retaliation that affirmed, without a doubt, that tenure would be required to do my job effectively. But just 4 short years after I finally received it, tenure was taken from me. I’m not alone. 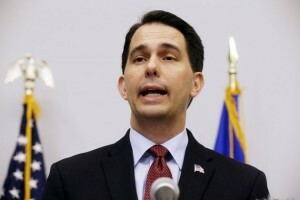 Tenure has been vanquished throughout the University of Wisconsin System. In its place is a savvy new #FakeTenure that fools even the most intelligent people into believing it is real. Except it is not. Following passage of #FakeTenure by the UW Regents later this week, firing me would be quite easy. All the Boss would have to do is decide that the Department of Educational Policy Studies no longer . 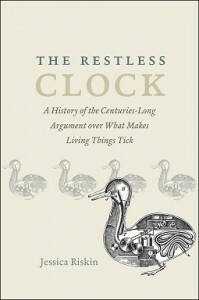 . .
Jessica Riskin’s The Restless Clock situates a new dialectic at the center of the life sciences, the role played by agency—simultaneously underscored, dismissed, banned, and advocated—in our relationships to nature and its mechanisms. From a review at the Times Higher Ed: The Restless Clock is a sweeping survey of the search for answers to the mystery of life. It begins with medieval automata – muttering mechanical Christs, devils rolling their eyes, cherubs “deliberately” aiming water jets at unsuspecting visitors who, in a still-mystical and religious era, half-believe that these contraptions are alive. Then come the Enlightenment android-builders and philosophers, Romantic poet-scientists, evolutionists, roboticists, geneticists, molecular biologists and more: a brilliant cast of thousands fills this encyclopedic account of the competing ideas that shaped the sciences of life and artificial intelligence. Riskin writes with clarity and wit, and the breadth of her scholarship is breathtaking. In particular, she explores scientific theories that aimed for some built‑in “agency”, some active principle that allowed matter to move in a way that did not require a predesigned mechanism (which seemed to imply a divine designer). Her goal is to “re-open scientific possibilities” – to show that, while passive mechanism is the “winning” principle in science, the . 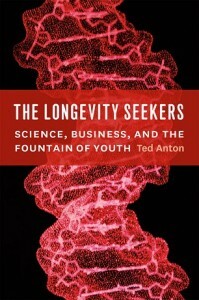 . .
Our free e-book for March is Ted Anton’s The Longevity Seekers: Science, Business, and the Fountain of Youth *** People have searched for the fountain of youth everywhere from Bimini to St. Augustine. But for a steadfast group of scientists, the secret to a long life lies elsewhere: in the lowly lab worm. By suppressing the function of just a few key genes, these scientists were able to lengthen worms’ lifespans up to tenfold, while also controlling the onset of many of the physical problems that beset old age. As the global population ages, the potential impact of this discovery on society is vast—as is the potential for profit. With The Longevity Seekers, science writer Ted Anton takes readers inside this tale that began with worms and branched out to snare innovative minds from California to Crete, investments from big biotech, and endorsements from TV personalities like Oprah and Dr. Oz. Some of the research was remarkable, such as the discovery of an enzyme in humans that stops cells from aging. And some, like an oft-cited study touting the compound resveratrol, found in red wine—proved highly controversial, igniting a science war over truth, credit, and potential profit. As the pace of . . .